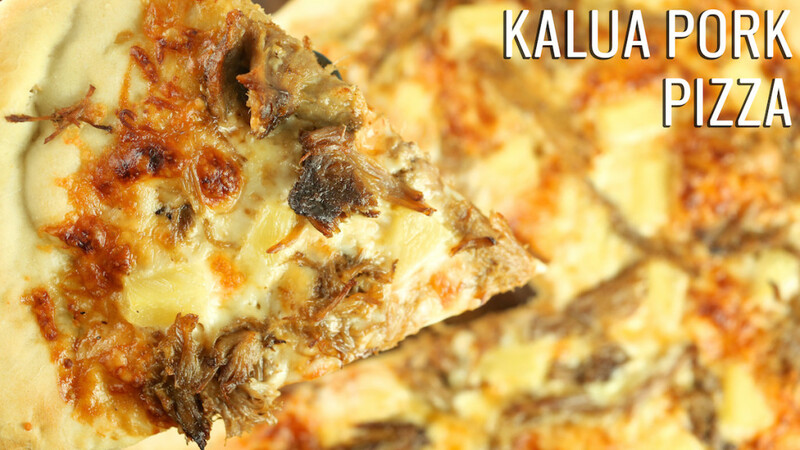 A few weeks ago, I shared my homemade Kalua Pork recipe. It was amazing, but man, that’s a lot of pork for two people! What to do with the rest of it? Put it on a pizza, of course. 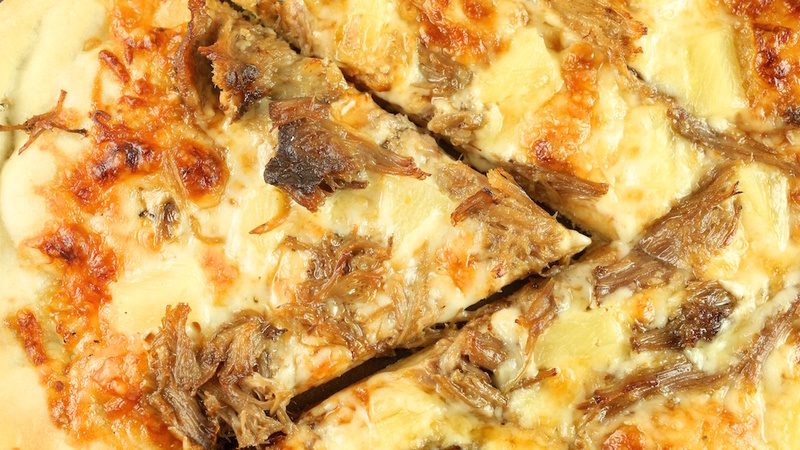 I love the combination of the salty, savory pork with the sweet, juicy pineapple chunks. I wish I had brought a few back with us from Hawaii. The pineapples there just melt in your mouth like butter. Alas, I did not plan ahead, so we made due with canned. We used the same dough recipe from our Fig & Prosciutto pizza. It’s really easy to make and is our favorite homemade pizza dough recipe. Since the recipe makes two pizza doughs, you could take this opportunity to make our Bacon & Eggs Breakfast Pizza. 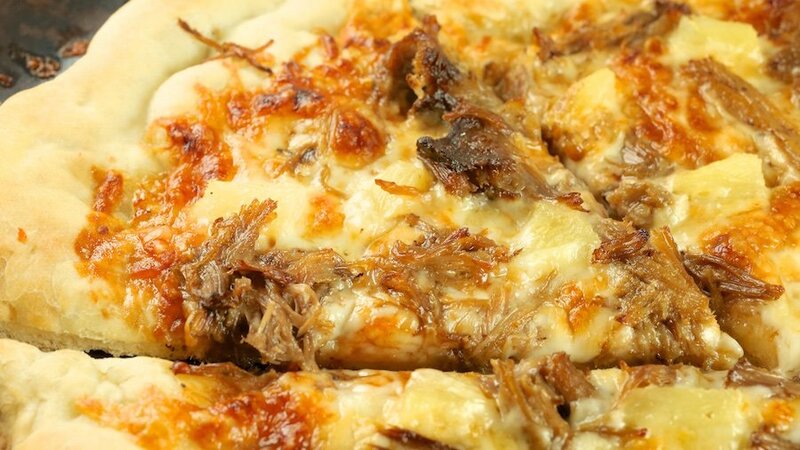 I hope you enjoy the Kalua Pork Pizza recipe. You can always kick it up a notch with some Sriracha or red pepper flakes. In the bowl of a stand mixer, combine the water, yeast, sugar, salt, and olive oil. Let sit for 10 min. With dough hook attached, add in flour and mix on low. Once mixed thoroughly, increase speed to high and knead the dough for 10 min., until the dough pulls away from the sides of the bowl and forms a ball on the hook. Place the dough in a bowl and coat in olive oil. Cover and place in a warm place to rise for about an hour. It should double in size. After the hour, punch the dough down and divide in half. If you aren’t making two pizzas, refrigerate one ball to use within a few days or freeze it for a month. If you have a pizza stone, place it in the oven and preheat to 500 degrees. Once it reaches temperature, keep it on for 30 min before putting the pizza inside. Pat or roll out the dough on a well-floured surface into about an 8in round. Then, stretch it out over your knuckles, trying to keep it round, until it reaches a 14in diameter (this can take a bit of time. The dough is very elastic and easy to get holes in it, but I just took dough from the crust and mended them). Remove your pizza stone from the oven. Place dough on top. Spread Sweet Baby Ray’s BBQ sauce evenly across the dough. Top with your mozzarella cheese. Evenly distribute Kalua Pork and pineapple chunks. Place stone in oven until cheese is bubbly and golden, about 10-15 minutes.